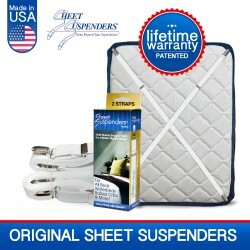 Sheet suspenders help keep your sheets secure providing a better night’s sleep. Suspenders are great for all beds, waterbeds and even cribs. Suspenders have two adjustable straps with four easy to open clips to hold all sheets including older, larger and flat sheets firm and smooth. 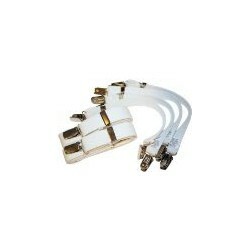 Clips have nylon inserts so they won’t harm mattresses. Once suspenders are in place there’s no need to lift your mattress when making the bed. Suspenders can even be used to keep your ironing board cover and picnic tablecoth in place. Machine wash. Made in USA. 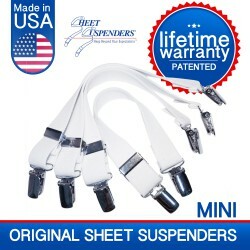 Sheet Suspenders® There are 3 products.